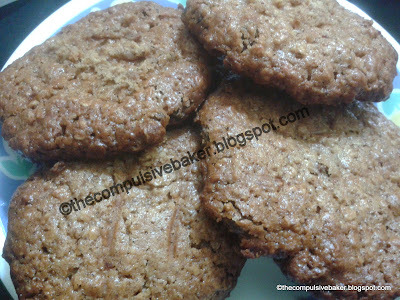 The Compulsive Baker: Raisin, Honey and Oatmeal Cookies - Finally the Real Breakfast Cookie ! Raisin, Honey and Oatmeal Cookies - Finally the Real Breakfast Cookie ! Two weeks of unlimited baking...Yet another of my Baking Workshops comes to an end...Whoa ! What fun! Imagine baking every single day for the last 15 days...and one of my favourites being the Raisin, Honey and Oatmeal Cookies...Large jumbo cookies...This one is essentially the cookie that you can grab when you are on the go...an then ..yummm.....you will make a mental note to grab two next time you are on the run !! Why it makes this one, the ultimate breakfast cookie, is because it is filled with Quick Rolled Oats, Whole Wheat, Dried fruits, Walnuts, Honey and a generous sprinkle of cinnamon...I am not going to start off on the nutritional facts, but this is definitely quite a power packed cookie, and with all that honey, raisins and cinnamon, this one tops the taste chart too. I have tried baking similar cookies with less butter, but they are no where near these...moist and chewy from all that honey and if you want it crisper, just bake a little longer at a lower temperature ( see method for temperature details) on the bottom rack and they turn crisp around the edges and still stay chewy inside and, better still...if you want it crisper all through to the center, it needs a little more persuasion...bake it just a lil longer...But which ever way you bake them, they turn a beautiful deep brown with the honey and sugar caramelized all around the edges. What I do, is, bake one batch this way and another batch that way, making sure I have the best of both , the chewy world and the crispy world !! And if you are looking for something that can wean you off chocolate, this might just be the answer for you.... and if this cant do it, then you really are a faithful chocoholic !! 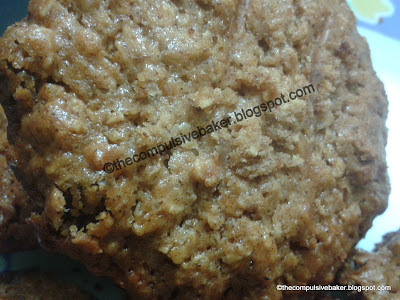 You can reduce the cinnamon and nutmeg to 2 tbsp and 1/2 tbsp respectively, but I love the punch that these aromatic spices deliver and also colour the cookie a shade darker. Also, you can reduce the white sugar to 1/4 cup ( 2 Fl.oz. ), but again this extra sugar aides in caramelizing the honey. This is a drop cookie, so the batter will have a drop consistency. This particular one is wetter than the others because of the honey which is runny (!! my attempt at humour) But don't worry. It will firm up beautifully once it has been refrigerated. And no, this time I have no photos other than the finished product simply because I forgot. But next time I am baking a drop cookie, I am definitely taking some photographs for easy understanding. All you need to make this cookie batter is a large mixing bowl and a wire whisk. The batter is made, covered and put into the fridge, all within 10 minutes. In a large mixing bowl add the butter and the powdered sugar and whisk to mix it well. Add both the eggs together and whisk vigorously so that all the wet ingredients are mixed well. Next start adding all the dry ingredients, baking powder first, whole wheat flour next and the oats. Mix really well so that all the ingredients are incorporated into the batter. Time to stir in the add-ons - the raisins. You can add dried fruits, dates, nuts, candied ginger and even choco-chips to this cookie....though I would really prefer to keep chocolate out of this one. You don't need to soak the raisins; they do not dry up during baking, on the contrary, they add to the chewy texture. Next add the aromatic spices, cinnamon and the nutmeg. If you are adding candied ginger, you can also add dry ginger powder or ginger spice drops to accentuate the ginger flavour. Mix all the ingredients really well with the whisk, cover with cling film and refrigerate for at least a couple of hours. Better still leave it in the fridge overnight to firm up really well. Preheat the oven to 250 Degree Celsius. Take the cookie batter out of the fridge and drop spoonfuls (almost the size of a lemon) onto a baking tray. Space the cookie at least 3 inches apart because they are going to spread out and you don't want them all merging into one large family cookie. Do not grease the baking tray with any butter/oil, if at all, line it with a baking sheet. The reason being that the butter on the tray will make the tray slippery and will make it easier for the cookies to slide into one another. Bake the cookies at 180 Degree Celsius for 18 - 20 minutes and then at 160 Degree Celsius for another 10 minutes. At this point the edges would have turned a golden brown and the centers would still remain soft but firm to touch. If you haven't reached this stage, bake at the same temperature for another 5 -10 minutes. If you want it crisper, move the tray to the lower rack and bake for another 10 minutes at 120 Degree Celsius. Honey can cause the cookie to burn if you leave them unattended. Keep checking through the glass door to make sure they are not burning. Avoid opening the oven door very often. Always remember that most kind of cookies need to be baked a tad softer than what you finally would want them to be, because they get crisper while they cool. So if you let them get really crispy in the oven while baking they might get way too hard and you might lose the flavours. But again, this cookie is an exception, because the honey does not let the cooled cookie become very hard. Once they have baked to your satisfaction, remove from the oven and let them cool on the tray for 3-4 minutes and then gently nudge them out with a flat spatula on a wire rack and cool completely.